Yes, I’ve made a few cupcakes in my day. So why take a class? I wanted to get back to basics. Other than reading dozens of cookbooks and taking a couples cooking class at ICE a few years ago, I have no former training in cooking. I am the most amateur of amateur “chefs” and tend to make things up as I go. But sometimes it’s nice to learn the “right” way to do something. I can chop, dice and mince, but should probably take a basic knife skills class one of these days–would probably pay for itself after being able to reduce my band-aid budget. So in the same way, I wanted to learn how cupcakes were made by professionals. I was most interested in learning to make icings. I stick with cream cheese based icings most times, simply because buttercream ends up too melty or sweet. When I first walked into Butter Lane Cupcakes in the East Village, the tiny storefront made me wonder where this class (max 12 people) was going to happen. Event he staff bakers seemed a little crammed. Then I noticed they had a place next door. Ohhhh… They had a separate baking studio, all set up for classes with three work stations each with measured ingredients and a shiny PROFESSIONAL KitchenAid mixer (want…). The best part of my class was it was only half full, meaning two people to a station vs the normal four per station. I worry that a 12 person class is just too big. Two people can help making the cupcakes, but the others would really just be standing around and tasting. 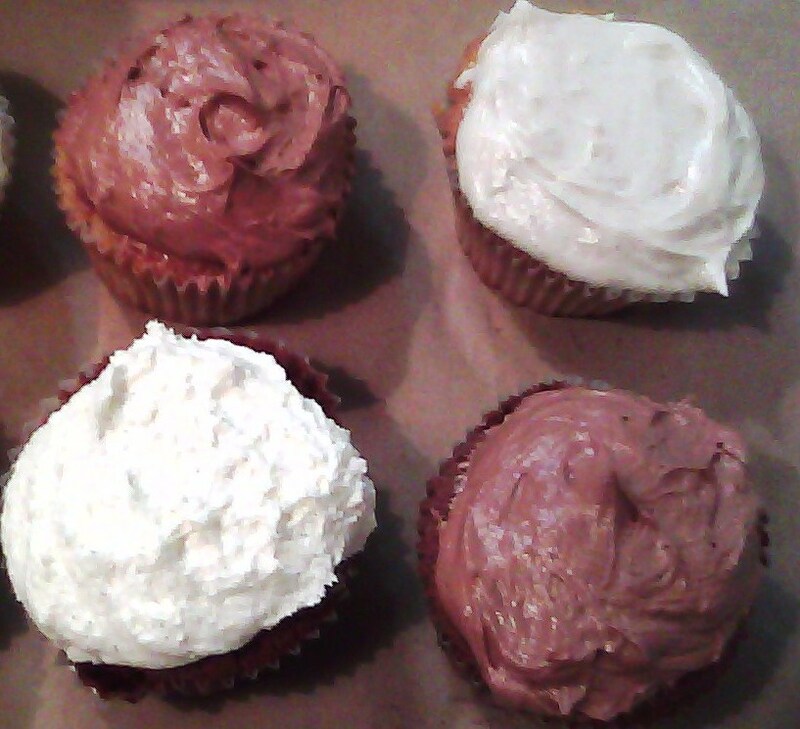 We made three types of cupcakes–vanilla, chocolate and banana. I was most interested in the banana. Not that I love banana, but more to see how they mixed in fruit, something I tend to do quite a bit. 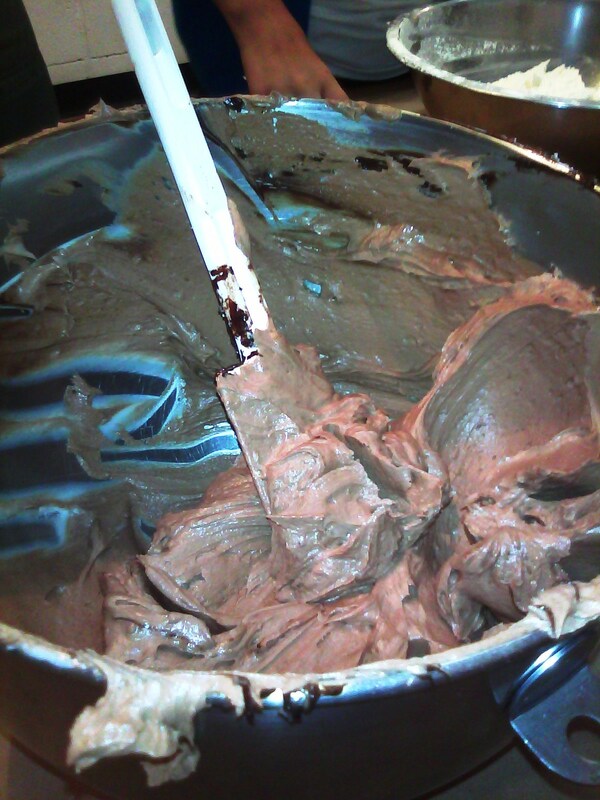 The two biggest lessons I took from the class is that people generally OVER mix the batter and UNDER mix the icing. 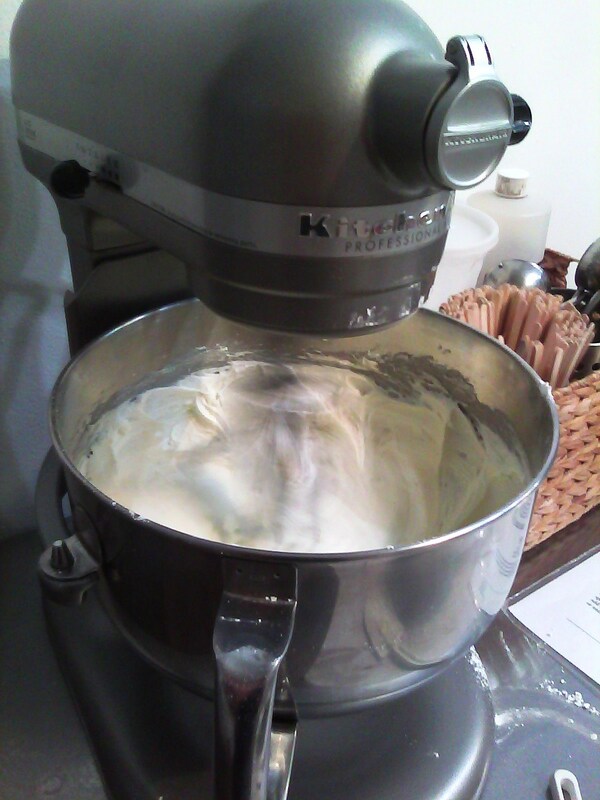 We kept the mixer on low the entire time while making cupcakes. The results were the fluffiest cupcakes I’ve ever tasted! As for the icings, when I saw we were adding 7 cups of confectioners sugar to 1lb of butter, I was scared. However, the result was perfect icing, sweet, but not too sweet, and certainly not gritty from the sugar like some icings get. We were told to store our cupcakes (you get to take some home!) on the counter, in the box, NEVER in the fridge. To my surprise, 3 days later, they still look great. So excited to have new basic recipes to work off of and make some amazing cupcake blends, just before the holidays! 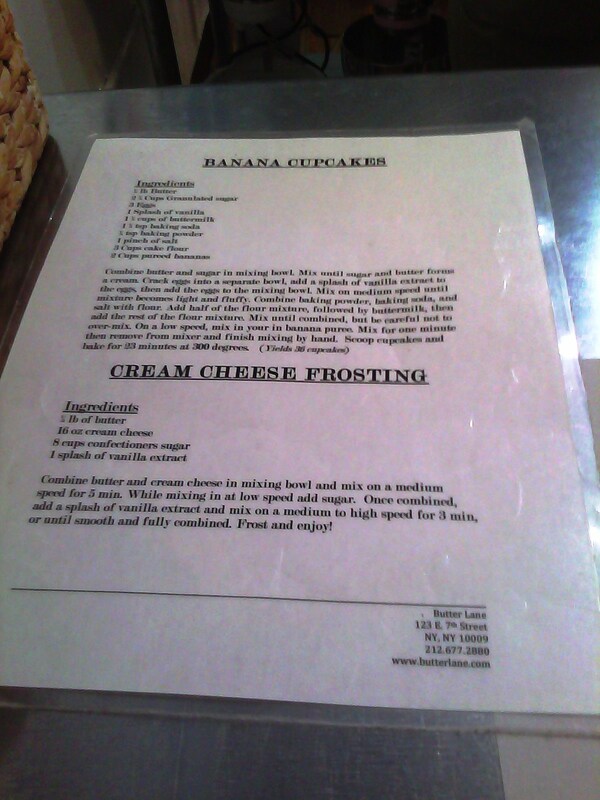 You could try reading the photo, or just visit Butter Lane’s Facebook page for the recipe! Butter Lane is kind enough to share their basic recipes with the world on their Facebook page. While the recipes are there, out in the open, I highly recommend the class to have someone guide you through the recipes and give tips, not noted on paper. Go on your own or with a friend. The thing I love about cooking, is it’s a universal language. You can go to a cooking class all on your own, be the shyest person there, and still find conversation flows easily. Classes are $60 per person, which includes making three types of cupcakes and three types of icings (plus variations on the icings), playing with a professional KitchenAid mixer (my favorite part! ), recipes, trade secrets, how to perfectly ice a cupcake without piping and a box of at least 4 cupcakes to take home (12 in my case due to the small class size). Oh and wait! There is a Brooklyn connection too! Butter Lane Cupcakes recently opened a Park Slope location–be sure to check it out! Previous postA Healthy Mac & Cheese–It Does Exist! They look delicious! Thank you for linking to my blog! I am the same with measurements! We need one measurement for everyone I think! Let me know how it goes!